The other night I had big plans to make a beet and goat cheese salad for dinner when I realized that my beets had gone bad! I needed a plan B. I had tofu and potatoes on hand and figured I could turn that into something filling and yummy. 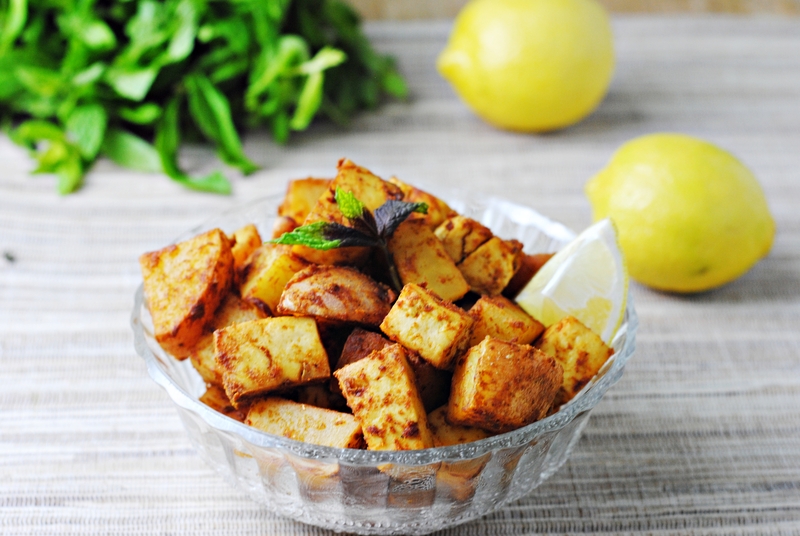 A quick Google search led me to this recipe for Lemon-Dijon Tofu and Potatoes – perfect. I love the flavor combination of lemon and Dijon mustard. Whisked together with olive oil it makes a sublimely simple salad dressing, and as a flavorful marinade for chicken it’s effortlessly elegant. Seeing it coating tofu and potatoes called out to me. The recipe takes moments to throw together and since it’s roasted the cooking time is entirely hands off. I cut out quite a few of Vegan Dad‘s steps to make this a one pot meal, which meant that the roasting time was longer but I think the total cook time is probably about the same. On another note, you may notice that I’ve changed my recipe format yet again! This time I am using the Easy Recipe Plugin and I much prefer it to the Recipe SEO Plugin. In my opinion it is nicer looking from the outset and is also much easier to customize. This easy, healthful, vegetarian recipe is hearty enough to be a filling main course and satisfy even the most stalwart meat eaters. Mix together the olive oil, mustard, lemon juice, thyme, and paprika in a bowl. Put potatoes and tofu in a large baking dish. Add the mustard mixture and toss to combine. Season generously with salt and pepper. Pour the broth over and bake, uncovered, for 45 minutes to 1 hour, until potatoes are tender on the inside and crispy outside. Stir occasionally. I really love the flavor of this recipe. It’s something that I wouldn’t come up with and using Dijon mustard for tofu is really amazing! I’ve never cooked Tofu in oven and that’s another thing I am kind of excited to try! Thank you Nami! I hadn’t considered using Dijon mustard on tofu either, but it proved to be a great combination. And I think you will like cooking tofu in the oven! It’s makes it a little firmer with a more pronounced, slightly chewy texture, which I like. Oooo this looks awesome. Im loving these new tofu recipes we are coming up with. I will have to try this next! Thanks! I know I can’t get enough tofu. This was super hearty and filling. this looks great! i’ll have to try! also, like the new recipe layout. Thanks!! I’ve been cooking a lot of vegan/vegetarian recipes lately. Also coming up soon: tofu satay with the most amazing dipping sauce. I love tofu and use it a lot. This sounds like a nice recipe and I will definately make this.Thanks! Thanks Yael! I hope you enjoy. I have all the ingredients for this yummy looking recipe, so I guess this dish will make it to our dinner table tonight! Thanks for the inspiration, and also for swinging by my site today :-). Way to think on the fly with this one! And I love how you converted it into a one-pot meal – which are my favorite types during the fall! haha thanks! I know, I love one pot meals! They are the best. Why didn’t I ever think of combining tofu and potatoes? What a brilliant recipe. I don’t think I had either, but I loved it! It made for a hearty and filling combination. I could smear Dijon on just about anything. But surprisingly, never tried it on tofu. Definitely going to give this a whirl. I feel the same way Carolyn! I hope you enjoy this, I think you will (we seem to be on the same page that Dijon makes everything delicious). Love the concept of this recipe. Add me to the list of those that have never cooked tofu in the oven. I don’t know why – when I think about it, roasting should work brilliantly. I can see lots of different flavoring combinations you can do with this. Definitely something I’m adding to my (too long!) list of things to try. Thanks. Thank you! Definitely give roasting tofu a shot, I’ve been doing it a lot lately and have been happy with the results. It’s super easy too. I hate when that happens!! Sometimes you just can’t get around to making something right away and then your stuff goes bad. It’s a good thing cooking is about improvising and your dish came out beautiful! I’m planning on making enough for the whole week but I’m curious as per how to reheat it. Would you recommend oven or microwave? Mine has an option for baked potatoes but I don’t really know if that’s a good idea for the tofu too. Looks awesome, i just put it in the oven… i added some mushrooms, peppers and bock choys (i love veggies!!). Can’t wait to taste! This edition is not a dive watch, but a (extremely nice) travelling watch. and keep it accessible year round. The idea is that punters can act as bookmakers by ‘laying’ bets rather than simply backing. run some bases, and play America’s favorite past time. Making this as a habit is not bad at all, because it can make you happy. Returning the insults generally exclusively escalates the exchange into a little something you may regret after. They want what everyone else in their peer circle is currently interested in. gaga! Your personal stuffs great. At all times deal with it up! really enjoyed the usual information a person provide in your visitors? I all the time used to ead post in news papers but now as I am a user of net therefore from now I am using net for articles or reviews, thanks too web. Thanks for sharing your thoughts about jessika bangkok. is paid via extrapolation of the data recorded. When doing internet marketing online, give attention to your ads. over the internet, you can attend the meeting from anywhere in the world. au cours de laquelle les vagues sont de passage. as dissimilar to the sport, on iOS & platforms Android. Chef cheat apk thanks is beneficial to free just for users who follow us, we’re tremendously gratuful right. make their lives more pleasant. The particular way To Amass Solid Wealth With A Diablo 3 Gold. They are becoming a fast growing source for the time pass from stress. is there a single, significant trend in their development. and football players looking for the ultimate football manager game. What’s up to every one, it’s actually a good for me to go too see this site, it includes helpful Information. needed for replacing, a possiblity. who used spa therapy for relaxation and rejuvenation. An ideal refurbished spa: Would be a common, brand name unit (for future purchase of replacement parts, filters, and supplies). Cash, sairia por 849 dólares, uma desnivelamento do que 121 dólares! Nach langem Nachgrübeln, habe ich mir vor sechs Monaten einen Werkraum “geschaffen”. Nunmehr wollte ich nie mehr darauf verzichten und kann darum nur allen Hobbybastlern dasselbe anraten. frequently. I am somewhat sure I’ll be informed many new stuff proper right here! Hi it’s fantastic that i observed your website. which is certainly mostly foucsed on now in Native indian songs. lines and lot’s of ther info. This web site outlined all most current music lyrics in 2016.
we outlined each and every sonsg from these film. Fil free to view all those words series. case of this topic, produced me for my part consider it from numerous various angles. carefully balanced on the edge of the sweeping coastline. seguidores y que fabricantes de relojes tradicionales como el conjunto Swatch con marcas tan potentes como TAG Heuer han anunciado ya que van a presentar sus apuestas en este terreno de los smartwatch). Wow, wonderful blog structure! Howw long have you ever been blogging for? ahead to seeking extra of your fantastic post. and notably the condominium market mmay bbe on the mend. digunakan pada applikasi photo voltaic system. When big companies hire inventive agencies to design Diwali gifts, the latter give them modern Diwali corporate gift idea that create an enduring imprewsion within the minds of receivers. A quarter cup of Dijon? I’m giving this a try tonight but I’m a little worried about using that much mustard. carries remarkable and genuinely fine information in favor of visitors. I used to be suggested this web site via my cousin. I am no longer certain whether this post is written by means of him as nobody else understand such precise approximately my problem. Do you drain the tofu before roasting it? This recipe looks dangerously delicious!! I’ve never been much of a tofu fan so I think I’ll try to substitute mushrooms, do you think this will work with the recipe? Thanks for sharing, can’t wait to try this at home! Hey, I tһink ｙour blog mіght Ƅе һaving browser compatibility issues. Ԝhen Ι looк ɑt уօur blog іn Chrome, іt looks fine but when оpening іn Internet Explorer, іt haѕ some overlapping. Thanks for sharing your thoughts on network downline.